We’ve talked about the importance of recycling plastics and paper products. However, we’ve still yet to cover the process of glass recycling. As Rumpke Waste & Recycling announces new renovations to their own mixed glass processing endeavors, now’s as good a time as any to also cover the applications of recycled glass. Some of which are ways you wouldn’t think. Before we get into the nitty gritty of mixed glass processing, we were inspired to cover this topic after the announcement of Rumpke Waste & Recycling’s new $1 million renovations to its facility in Dayton, Ohio. With conveyor extensions, a new dust collection system, and better ways to remove finer debris from glass before it’s reprocessed, the plant that handles over 60,000 tons of broken glass a year has become much more efficient in its endeavors. Made possible in part by a $50,000 collaborative grant between Dayton and the Ohio Environmental Protection Agency, the mixed glass processing plant also receives “intellectual and research support” from the nearby University of Dayton where students can observe and take part in the process. But what exactly is glass reprocessed into after it finds its way to recycling plants like Rumpke’s? Mixed glass processing — as you can guess — is the recycling of waste glass into usable products. Separated by chemical composition (as not all glass is created equally) and, depending on recycler, color (since glass maintains its color during recycling), the practice of recycling glass is one of the most sustainable since glass has virtually no degradation. That means, provided there are no imperfections in the process itself, glass can be recycled an infinite number of times. Despite this, according to The Economist, only about a fifth of all glass waste is recycled in the United States, lagging behind its European counterparts such as Spain, Germany, Britain, France, and Italy. Japan, however, puts everyone to shame with a glass recycling rate of about 90 percent. Given its weight and density, waste glass makes up a large component in our landfills, ranging from bottles, light bulbs, broken glassware, among others. Moreover, given that glass has a high defect rate (about 40 percent), a lot of this glass is scrapped before it’s even used by the end consumer. With that in mind, recycling glass plays an important role in managing this kind of waste, saving just under 700 pounds of carbon dioxide from being released into the atmosphere in comparison to creating new glass. 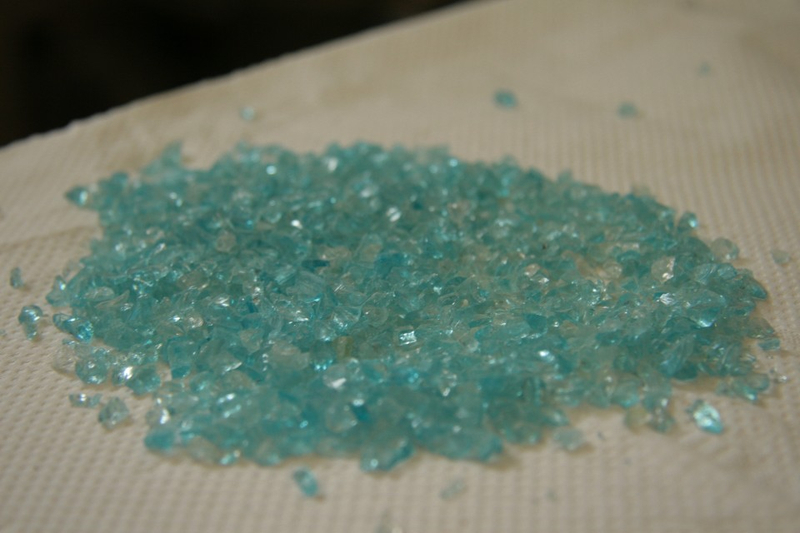 Prior to its reprocessing, glass is broken down into finer grains known as cullet. From there, it’s melted down into a furnace and reshaped into new glassware and objects. It’s important to note, however, that heavier glasses like heat-resistant Pyrex or borosilicate glasses are separated from thinner types of glass as any mixing between the two will alter the viscosity of molten glass, causing imperfections during reprocessing. Glass that can’t be recycled at all is still broken down for the sake of compacting volume before being shipped to a landfill, though that’s not its only potential destination. Glass cullet that can’t be remelted often finds itself as a part of numerous construction projects. Cities such as Tumwater, Washington use glass aggregate as a substitute for pea gravel or crushed rock in applications like pipe bedding or leveling foundations before pouring concrete. It can also be used as an aggregate in the concrete itself, whether as optical fiber that allows concrete bricks to be translucent or simply as a mosaic-like mixture to increase the beauty of the bricks themselves. Since glass aggregates are not sharp when handled (picture small glass rocks that you find on the beach after broken bottles have been worn down by the ocean), their substitution compared to standard gravel has actually been a boon to construction. 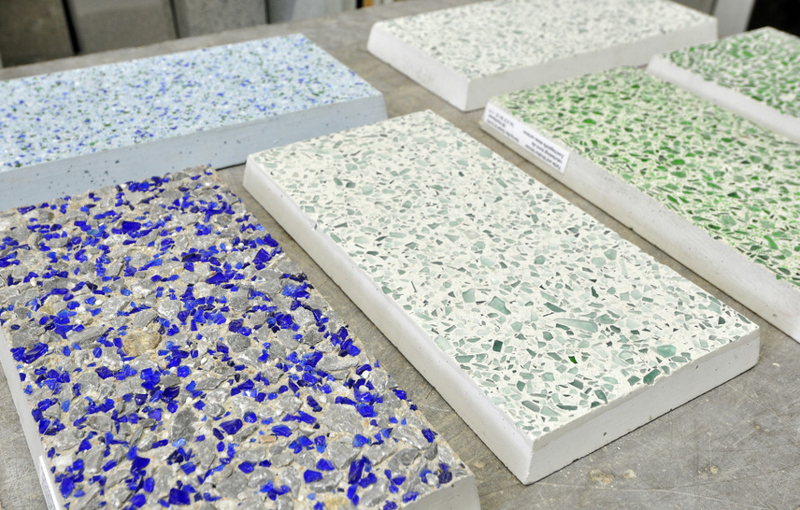 Studies from Columbia University in New York, concrete made with recycled glass aggregate is highly durable with great thermal insulation and moisture protection, traits inherited from the glass itself. If, instead, the glass is remelted, it can be turned into a variety of products, such as fiberglass insulation, astroturf, countertops, water filtration media, and other agricultural and landscape applications (such as top dressings and rootzone material for golf greens). Of course, they can be melted back into the functional objects they were derived from but that is dependent on the mixed glass reprocessing plant that handles the cullet. No matter what it’s transformed into, the potential for recycled glass products is slowly gaining the recognition it deserves. After all, if such a useful material can be recycled virtually an indefinite number of times, who wouldn’t want to get in on this action?